PULLMAN, Wash.-After leading Western Oregon to the NCAA Division II National Tournament in three of the last four seasons, head men's basketball coach Jim Shaw has accepted a coaching position at Washington State University. "Under Coach Shaw's leadership, Western Oregon has become nationally recognized in men's basketball," Executive Director of Intercollegiate Athletics Curtis Campbell said. "I want to thank Jim for the impact and leadership he has provided for this program and wish him all the best in his next endeavor." A national search for Western Oregon's next head men's basketball coach will begin immediately. At Washington State, Shaw will serve under newly-appointed head coach Kyle Smith. "This was the best four years of my career professionally," Shaw said. "Being able to reconnect with the people that have made an impact on my life and work with those groups again was truly special. This was a tremendous opportunity to pay it forward and I wouldn't have traded it for anything." Shaw and Smith share a background working under longtime Saint Mary's College head coach Randy Bennett. Smith was an assistant for Bennett from 2001-10 while Shaw worked with the NCAA Division I Gaels from 2013-15. In four seasons as the head coach at Western Oregon, Shaw accumulated a 102-30 (.772) overall record and a 63-17 (.787) mark in GNAC games. In his initial season at the helm, Shaw led the Wolves to a regular-season GNAC title and went on to capture the GNAC Tournament title and the West Region crown before bowing out in the NCAA Division II national semifinals. Shaw's teams reached the GNAC title game in all four seasons with titles in 2015-16 and 2017-18. Finishing the year with a 31-2 overall record, Shaw's 2017-18 team set a GNAC record for conference wins (19) and conference winning percentage (.950). University of Arkansas Fort Smith Director of Athletics Curtis Janz announced Tuesday morning that Jim Boone has been hired as men's basketball head coach. Boone recently completed his seventh season as head men's basketball coach at NCAA Division II Delta State University, guiding the Statesmen to a 19-12 overall record, a 12-8 Gulf South Conference record, the Gulf South Conference Tournament Championship and their 17th berth in the NCAA Division II National Tournament. 'Not long after the coaching search began, Coach Boone became an intriguing candidate. He has built championship programs at many NCAA Division II institutions and has always done it with integrity. I believe Coach Boone is a perfect fit with me and the rest of our athletic department,' Janz said. Boone, a native of Winfield, W.Va., has been a collegiate head coach for 33 seasons at the NCAA Division I and II levels. He finished this past season with 558 career wins, which ranks him 14th among active NCAA Division II coaches in wins and among NCAA Division II's Top 40 All-Time Winningest Coaches. 'Everything excites me about the university from the gorgeous campus, the direction of the athletics program under the leadership of Curtis Janz and his staff, the outstanding tradition of UAFS basketball and the entire Fort Smith community. The day I toured Fort Smith and walked through campus I knew immediately it was a very special place and a tremendous opportunity for our family,' Boone said. 'We can't wait to immerse ourselves in the university, in the community and in building on previous relationships and creating new ones with the high school basketball coaches of the state and surrounding areas. We are so excited to roll our sleeves up and get to work on building an elite program. This is truly a university where we can have it all - a championship basketball program, represented by quality student-athletes and built with great integrity to last for long-term.' Boone inherits a UAFS team that featured only one senior on its 12-player roster. The Lions finished 10-19 overall and 4-12 in the Heartland Conference and earned their eighth-consecutive berth in the Heartland Conference Tournament, losing to eventual tournament runner-up Dallas Baptist in the first round. 'Our vision is to build a championship quality program, a program that will compete for conference, regional and national prominence. We do not have a specific time-table or short-range goals, but I can tell you that we will hit the ground running to create a championship culture that will produce a program that has the foundation to last, a program that will be built with great integrity,' Boone said. 'And, we will produce a championship-caliber program that will be among the nation's elite, a program that our university and our community will be very proud of.' UAFS, along with six other Heartland Conference teams, will begin its first season as a member of the 19-team Lone Star Conference beginning this fall. The Lone Star Conference will be the largest conference in NCAA Division II. 'Coach Boone will develop an elite level basketball program here at UAFS,' Janz said. 'He is a program builder and develops student-athletes on and off the court, but what is most impressive is the culture that he builds within the basketball program. That culture will make our overall athletic culture stronger.' Boone said the Lions will be fundamentally-sound and will emphasize a hard-working offense that emphasizes playing together, sharing the basketball and taking great shots. 'Offensively, we will play a style that our fans and the Fort Smith community will identify with and will love. We are a program that is founded upon simplicity, fundamentals and their execution. We work to develop our players to maximize their abilities and to put them into positions to enhance their strengths,' Boone said. 'We are not as much about running plays as we are about teaching our players how to play. It is our belief that players win games in March, not plays. We will be a hard-working offense that shares the basketball, we will play together and value teamwork, we will value taking care of the ball and we will take great shots. We're going to be a lot of fun to watch as our players develop both individually and collectively throughout the season.' Boone's teams have been noted for their defensive toughness, and he said the Lions will be as well. 'We pride ourselves on being a defensive program that is rooted in a blue collar work ethic, that will be mentally and physically tough and that will be among the nation's very best,' Boone said. 'We will play all man-to-man. It's what we do, it's our trademark, it's who we are and it's our identity. We will be a great defensive team' As a NCAA Division II head coach, Boone has compiled a 466-251 record, leading four NCAA Division II programs to the NCAA Division II National Tournament. The next few weeks will be busy for Boone as he looks to lay the foundation for his new team. 'The first two weeks are always like a whirlwind. There is so much to do, and it's important to remain focused on our priorities and on creating a championship culture,' Boone said. 'Obviously, one of our most important objectives will be to meet our new team and to let them know that they are a part of our family now and that they are our guys. We want to lay out the pillars of our culture - hard work, toughness, passion and unity. As well, recruiting will be important, not just for now, but for building the relationships that will make tomorrow's recruiting successful.' He said he also will use the next few weeks to begin building relationships with the area's high school coaches. 'We will utilize this period to meet as many coaches as we can in our immediate area, while completing our roster for the coming season and building a championship culture. It's all about people and leadership. We want to do our due diligence in selecting the right people, young men of character and integrity that fit our culture,' Boone said. 'We will hire our staff, and, very much as in recruiting our team, our staff will be about the right fit, people who fit and will embrace our culture. Lastly, we want to get around campus and meet our campus and our Fort Smith community. We are so excited as a family to call Fort Smith home. We are here for the long-term, and we will be invested in our community.' Boone leaves tradition-rich Delta State as the third-winningest coach in program history with 128 wins. In 2017-18, the Statesmen made their third consecutive trip to the GSC semifinals, making Delta State the only school to do that in each of the last three seasons, and in 2016-17, he led the Statesmen to their 16th NCAA Tournament appearance, where they advanced to the second round and closed the year with a 23-9 record. In 2013-14, Boone led the Statesmen to one of their best seasons in program history, as they captured the Gulf South Conference regular-season title and made a run to the NCAA Division II Sweet 16. Boone was named GSC Coach of the Year, marking the seventh time in his career he has captured such an honor. In all, the Statesmen completed a two-year turnaround of a program that had won just six games the year before Boone took over in 2012-13. The 17-game improvement represents the best among NCAA Division II institutions over this period of time. Prior to taking over as head coach of the Statesmen, Boone spent the 2011-12 season as head coach at West Virginia Wesleyan College, guiding the Bobcats to a school-record 22 wins at the NCAA Division II level and the program's first ever NCAA Division II Regional Tournament Championship appearance. 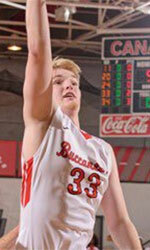 Under Boone's leadership, the Bobcats (22-9) defeated perennial NCAA Division II power Winston Salem State in the opening round of the NCAA Tournament before falling to West Liberty State. Boone began his career as a standout player at West Virginia State College, where he was a four-year letterman. He earned his bachelor's degree in Accounting (1981) and followed that with a master's in Business Administration from the University of Kentucky (1982) with a concentration in Marketing. His coaching career brought him back to his alma mater, spending three seasons as the head assistant coach and primary recruiter from 1982-85 at WVSC. Boone made the jump to NCAA DI basketball in 1986 as an assistant at Charleston Southern University, where the Buccaneers won the Big South Conference Championship. That championship experience led Boone to California University of Pennsylvania as head coach. Over the next 10 years, Boone led California (Pa.) to unprecedented success, including a 228-71 record. During his time with the Vulcans, Boone's 1992 squad posted 31 wins and was the number one team in the country. Boone also added two NCAA DII Final Four appearances, six regular season conference titles and six trips to the NCAA Tournament at the helm of the Vulcans. Boone finished his time with a school-record 228 wins and a .763 win percentage. Boone was inducted into the California (Pa.) Hall of Fame in 2005. From California (Pa.), Boone moved on to the challenge of rebuilding NCAA Division I Robert Morris University, eventually leading the Colonials to the NEC Championship game in 2000. In 1999 and 2000, he led RMU to a record of 25-13 in the NEC and produced two of the best seasons in Colonials history. Boone left RMU after 2000 to take on the task of turning Eastern Michigan University into a competitive DI program. In five seasons at EMU, Boone quadrupled the program's wins total and set several EMU attendance records. He left EMU after the 2005 season for Tusculum College, a member of NCAA DII and the South Atlantic Conference. In 2009, the Pioneers won a school-record 20 games and the made its second-ever trip to the NCAA Tournament. He still holds the school record for conference wins over a four-year period at Tusculum. During his career, Boone's teams have won seven conference championships, four tournament titles and have made 11 postseason appearances. From 1990-96, his California teams recorded more than 20 victories for six consecutive years tallying an impressive 150-33 mark during that span. His 94-24 league record in the PSAC is still the best of any coach in that conference's history. He was named PSAC Coach of the Year on three occasions (1988, 1992, 1996) and NCAA Region Coach Year twice (1992, 1996). He is married to the former Stephanie VanVranken, and they are the proud parents of two sons, Jimmy and Joey. Here is the weekly review of the top performing Jaguars alumni, who are currently playing in pro basketball. #1. Greg Hire (6'7''-F-87, graduated '10, plays pro in Australia) was the major contributor in a Rockingham Flames' victory against the leader Wanneroo (6-1) 98-92 in the Australian State League (second division) in Thursday night's game. He had a double-double by scoring 20 points and making 14 passes. Hire also added 9 blocks and 5 steals in 32 minutes. It was the game of the round between two top 3 ranked teams in group SBL. Rockingham Flames (5-2) are placed third. It was his team's third consecutive victory in a row. But this is still an early stage of the season and everything may happen. Hire has individually a very good year with high stats. He averages 22.7ppg, 9.3rpg, 10.0apg, 3.0bpg and 2.3spg in three games he played so far. #2. Keshun Sherrill (5'9''-PG-94, graduated '17, plays in Holland) contributed to an easy victory against the eighth-ranked Leeuwarden (8-25) 82-63 in the Dutch Eredivisie last Wednesday. Sherrill scored 10 points and added 3 assists. New Heroes Basketball Den Bosch (24-8) is placed third in the Eredivisie. It was his team's eighth consecutive victory in a row. There are only two games left until the end of the Regular Season. So now every game will be critical. Sherrill has relatively good stats this season 12.6ppg, 2.5rpg, 3.6apg and 1.7spg. #3. Ben Purser (6'7''-F-90, graduated '11, currently in Australia) led Perry Lakes Hawks to an easy victory against the 11th-ranked Tigers (3-5) 98-81 in the Australian State League (second division) on Thursday night. Purser had a double-double by scoring 14 points and making 12 passes. He also added 10 blocks and 9 steals in 37 minutes. Perry Lakes Hawks (15-3) are placed in SBL group. But the season just started, so everything may happen. It's Purser's sixth year with the team. Purser has relatively good stats this season 11.9ppg, 5.9rpg, 6.7apg, 2.4bpg and 3.4spg in seven games. #4. Experienced Ben Madgen (6'4''-G/F-85, graduated '10, plays pro in Germany). He could not help HAKRO Merlins Crailsheim (7-22) to beat ratiopharm Ulm (17-12) in the German BBL. Madgen scored 7 points. HAKRO Merlins Crailsheim was edged 82-79 on the road by the much higher-ranked ratiopharm Ulm (#6). It was HAKRO Merlins Crailsheim's fourth consecutive loss in a row. Madgen has relatively good stats this season 14.6ppg, 4.5rpg and 1.7apg. #5. Kyle Armour (6'0''-G-89, graduated '12, plays in Australia) was not able to help Lakeside Lightning (10-8) in their last game. Despite his very good performance his team lost 88-102 in Hamilton Hill to the much lower-ranked (#10) Cougars in the SBL group. Armour scored 17 points and had 4 steals in 37 minutes. But the season is still in it's first stage and everything can happen. Armour has very impressive stats this year 15.3ppg, 3.8rpg, 4.8apg and 1.7spg in six games. Notice: The list above includes only some of the Augusta University alumni playing currently in pro basketball. Check COMPLETE LIST. Every week we bring you a list of the top former Broncos players who continue their career in pro basketball. #1. Terrence Drisdom (6'5''-G-92, graduated '15, plays pro in Mexico) was the major contributor in a Rayos de Hermosillo's victory against the league outsider Pioneros Los Mochis (2-8) 89-78 in the Mexican CIBACOPA on Tuesday night. He recorded 20 points, 9 rebounds and 8 assists in 32 minutes. Rayos de Hermosillo (6-5) is placed fifth in the CIBACOPA. It was his team's fifth consecutive victory in a row. But this is still an early stage of the season and everything may happen. Drisdom has relatively good stats this year 12.8ppg, 7.5rpg and 4.1apg. #2. Matthew Ganuelas-Rosser (6'5''-F-90, graduated '12, plays in Philippines) contributed to an easy victory against the league leader Phoenix (9-2) crushing them 114-91 in the Filipino PBA in Tuesday night's game. Ganuelas-Rosser recorded 8 points, 6 rebounds, 7 assists and 5 steals. San Miguel Beermen (7-4) is placed fifth in the PBA. This year Ganuelas-Rosser averages 1.8ppg, 1.7rpg and 1.3apg in 11 games he played so far. He is a naturalized Filipino. #3. Jordan Faison (6'7''-F-94, graduated '16, currently in Japan) led Tokyo Excellence to a victory over the fifth-ranked Saitama Broncos (3-5) crushing them 101-63 in the Japanese B League D3 last Friday. He was MVP of the game. Faison recorded a double-double by scoring 27 points and getting 10 rebounds. He also added 7 assists in 26 minutes; quite an impressive performance considering it's only Faison's third season in pro basketball. Tokyo Excellence (8-0) is placed first in the B League D3. So far his team won all eight games in the Second Stage. There are only four games left until the end of the Second Stage. So now every game will be critical. It's Faison's first year with the team. He has individually a very good season with high stats. Faison averages 22.2ppg, 9.9rpg, 5.0apg and 1.8bpg. #4. Larry Gordon (6'5''-F-87, graduated '09, plays pro in Germany) contributed to a 3-point Giessen 46ers' victory against the closely-ranked BG Goettingen (8-21) 98-95 in the German BBL on Sunday night. Gordon scored 14 points. Giessen 46ers (12-17) is placed 12th in the BBL. It was his team's first victory after seven consecutive loses. It's Gordon's first season with the team. He has relatively good stats this year 10.9ppg, 5.9rpg and 1.9apg in 29 games. #5. Experienced Luis Pulido (6'2''-G-85, graduated '07, plays in Mexico). He could not help Caballeros de Culiacan (7-4) to beat Gigantes (6-4) in the Mexican CIBACOPA. Pulido did not have that impressive stats last Tuesday. He recorded only 3 points in 16 minutes. Caballeros de Culiacan was defeated 107-97 on the road by the lower-ranked Gigantes (#4). It was Caballeros de Culiacan's first loss after seven consecutive victories. But the season just started, so everything may happen. This year Pulido averages 1.2ppg and 1.3rpg. Notice: The list above includes only some of the California State Polytechnica Un. Pomona alumni playing currently in pro basketball. Check COMPLETE LIST. Every week we bring you a list of the top former Golden Eagles players who continue their career in pro basketball. #1. 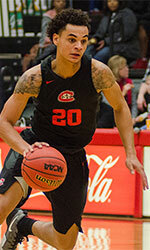 Keir Anderson (6'3''-G-95, graduated '18, plays pro in Brazil) led Campo Mourao to a 3-point victory against the closely-ranked Cerrado (6-7) 91-88 in the Brazilian Liga Ouro (second division) last Monday. He recorded 11 points in a mere 18 minutes. Campo Mourao (8-5) is placed second in the Liga Ouro. It was his team's fourth consecutive victory in a row. They will play only one more game in the Regular Season. And that game will be critical. This year Anderson averages 6.2ppg and 1.5rpg in 13 games he played so far. #2. P.J. Reyes (6'5''-G/F-88, graduated '12, plays in Mexico) led Halcones de Ciudad Obregon to a victory against the seventh-ranked Venados (5-7) 111-103 in the Mexican CIBACOPA on Tuesday night. Reyes scored 13 points. Halcones de Ciudad Obregon (7-3) is placed first in the CIBACOPA. It was his team's sixth consecutive victory in a row. But this is still an early stage of the season and everything may happen. Reyes has relatively good stats this year 11.6ppg, 3.8rpg and 1.8apg. He is a naturalized Mexican. #3. Justin Coleman (6'8''-F-94, graduated '17, currently in Austria) contributed to an Unger Steel Gunners Oberwart's victory against the closely-ranked Gmunden Swans (24-11) 84-79 in the Austrian A Bundesliga in Sunday night's game. Coleman scored 8 points and grabbed 6 rebounds in 18 minutes. It was the game of the round between two top 4 ranked teams. Unger Steel Gunners Oberwart (26-9) is placed second in the A Bundesliga. It was his team's fifth consecutive victory in a row. They will play only one more game in the Regular Season. And now that game is very crucial. This year Coleman averages 8.1ppg, 5.1rpg and 1.7apg in 33 games. He is a former Eurobasket Summer League player, which is considered top international summer league in the market. #4. Elliott Cole (5'11''-PG-94, graduated '17, plays pro in Kosovo) could not help Prizreni (12-16) in their last game on Friday. Despite Cole's very good performance Prizreni was defeated 76-72 at home by the higher-ranked Rahoveci (#3). He was the top scorer with 16 points. Cole also added made 6 passes and 4 steals. It's Cole's first season with the team. He has individually a very good year with high stats. Cole averages 17.5ppg, 3.8rpg, 4.4apg and 1.4spg. Notice: The list above includes only some of the University of Charleston, WV alumni playing currently in pro basketball. Check COMPLETE LIST.